Malone Golf Club is one of Ireland’s best parkland golf courses and it is virtually unknown. The club was founded way back in 1895, but the course has moved location no fewer than four times since its inauguration. Dunmurry became home to Malone Golf Club in 1962, and it’s situated 5 miles south of Belfast, in the lower Lagan Valley at Ballydrain. The first architect who drew up plans for the course was John Morrison from Harry Colt’s design company but ill health forced him to withdraw from the project. Commander John Harris from C.K Cotton & Associates then stepped in to lay out the first eighteen holes. 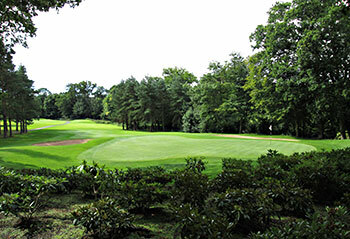 Two years later, Mrs Peggy Valentine, the Lady Captain, opened a third nine, which was originally called the Inner course, as it was laid out within the front nine of the main 18-hole layout. In 1965, moves were already afoot to redesign the course and Fred Hawtree drew up a plan which largely reflects the Ballydrain nine that’s in play today. This included a spectacular new par three 15th which would make good use of the lake. Due to financial constraints, it took another five years before the alterations were carried out, along with the introduction of a new 4th hole at the expense of the old 11th. In the 1980s, a decision was made to move some of the holes of the main course away from the low-lying area of the Lagan River. This resulted in holes 7, 8 and 9 being moved to higher ground, allowing Frank Ainsworth and David McLean to use their old location in the redevelopment of the Edenderry nine. The front nine is called Drumbridge and the back nine is called Ballydrain – named after the local area. Measuring almost 6,600 yards, Malone is a solid test of golf. Accuracy from the tee is demanded, because many mature trees wait to stymie the wayward tee-shot. Malone has seen some serious professional action: In 1966, Tony Jacklin recorded his first professional victory and in 1993, Gary Player claimed his umpteenth title when he won the Irish Senior Masters. Additionally, the course has hosted a number of prestigious amateur championships. Given that Malone has played host to all these events, we are very surprised that the course isn’t more widely recognised, because this is a parkland beauty. James W Finegan on the course: “It’s a spacious beauty (on 270 acres), with an abundance of mature oaks, sycamores and pines, rolling terrain, the river Lagan bordering it on the east, and 27-acre Ballydrain Lake the centrepiece of the second nine. Black Mountain and the chequered fields of the Antrim Plateau provide a stirring vista from the 10th, one of the half dozen par 4s measuring well over 400 yards.” From Where Golf is Great – the finest courses of Scotland and Ireland. One of the best and most comprehensive golf course books we’ve ever read. Malone offers a good deal of interest and variety – there are many memorable holes. None more so than Malone’s signature hole – the charming short par three 15th. We are only talking about a short pitch, but the tee-shot must be played across a gorgeous lake. It’s amazing what such an expanse of water can do for the nerves! The same lake comes into play on the 18th, where the drive must carry the corner of the lake – anything hit to the right, all the way along this hole will be consumed by the water – it’s a cracking end to a lovely parkland golf course. If you are in Belfast and you’ve got your clubs handy, make sure you play Malone. You won’t be disappointed – the course is maintained immaculately and you’ll be hard pressed to find a better parkland course in Northern Ireland. Architect David Jones has consulted at Malone in recent years and this has resulted in the construction of a number of new greenside bunkers and the rebuilding of greens at holes 1, 3, 6, 7, 8 and 18. David was also responsible for the initial design of the sleeper edging at the par three 15th hole. I notice there are three non-links layouts above Malone in the current NI Top 30 chart, only one of which I’ve played. After visiting here a couple of days ago, I can only imagine that the other two courses are of a very high standard indeed if they’re worthy of higher ranking positions than this place! The main layout at 27-hole Malone really surprised me, its heavily undulating tree-lined fairways routed around a fabulous old parkland estate. Starting with a plunging left doglegged opening hole on the Drumbridge nine and ending with the right doglegged lakeside closing hole on the Ballydrain nine, this course hugged the contours beautifully during a round that just flowed effortlessly from one hole to the next. The new elevated tee box on the difficult 7th, rated stroke index 1, is one of the finest examples of in-house construction on a golf course that I’ve seen anywhere and the re-laid green on this hole is just one of several that have recently been upgraded. On the back nine, the signature par three 15th on the lake is a lovely hole to look at but, truth be told, it’s probably the weakest of the four excellent short holes on the card. The club celebrated 50 years of play at Ballydrain in 2012 but, because there are trees of far greater vintage throughout the estate, there’s a very mature feel to the course. Mention must also be made of a wonderful old clubhouse that has been sympathetically upgraded on one side with a modern glass-fronted extension and you have the perfect example of a golf facility that has embraced the old and the new quite effortlessly. With so many “city break” visitors coming to Belfast these days, it would surely make sense to form an alliance of clubs close to the city centre that would allow incoming golfers to play one or more of the courses for a reduced visitor green fee. What’s not to like about attracting additional income and, more importantly, having these golfers then spread the good news about just how good the golf is? Malone is my favourite Parkland course to play in the North of Ireland. An excellent course is always supplemented with immaculate greens, friendly staff and and top class food in the clubhouse. Not one to be missed. I've played many courses and Malone rates as one of the best. The facilities are excellent and the cpourse always offers a challenge as well as just being a nice place to be anytime of year. I always look forward to my visits to Malone. My favourite parkland course in the North of Ireland. It is always in immaculate condition and a must play if you are in the Belfast area. The clubhouse oozes class and the T-bone steak is the perfect way to end your visit to Malone. Most people who come to Ireland to play golf head for the links courses, but there are many outstanding inland courses as well, and Malone is certainly one of the best of them. It lies in a beautiful setting, so quiet and natural you’d never know you were so close to a large city. The course is demanding but entirely fair, and the greens are pure. At the center of the course is a beautiful lake that frames several superb holes on the second nine. I strongly recommend a visit to Malone during a golf trip to Northern Ireland. The following comments were made by Wayne Williams in an email to the Malone Club Manager: "My colleague and I very much so enjoyed our visit to your beautiful Golf Club this past Friday. I play at many different Golf clubs around the globe and can honestly say that playing at Malone was a very memorable experience. Not only was the course in excellent condition, despite the heavy rains the day before, but all the staff were professional yet friendly and approachable. The Golf Pro, the restaurant staff and indeed yourself all made us feel very welcome." The benefits of time and attention to detail come together rather splendidly at Malone, which is well worth its high-ranking among parkland courses in Ireland. I wouldn't call this a particularly challenging course or a particularly eventful one, but the walk through woodlands is immense, and the condition of the course is superb. Pick of the holes would be index one and two, two long par fours with blind drives and difficult approaches, while the par 3 15th over the pond is just one of those holes that will always stick out in your mind. The greens were sanded on the day we played - these things happen - so I can't really comment thus. As with an earlier reviewer I'd suggest that some of the members would do what they can to make you feel unwelcome, but they're best ignored, and it shouldn't put you off coming here, as it is just such a pleasure. My favourite parkland course in Northern Ireland , I have played this course four or five times and cannot wait to return , 7th hole is partially difficult , with the 18th holes being the most pleasing to the eye , great course well worth a visit! On a recent visit to Ireland had joys of playing Malone. A nice course. Some holes were quite boring though (10, 11, 12 and 16) which took away from the splendid first 9 and delightful 14th and 15th. The course itself is lovely and deserves 5, but the unfriendly members and professionals in the club shop dragged the course down. A must play course none the less.